Cairo, Egypt – 2 September 2015 - Cargill is investing U.S. $100 million to double the capacity of its soybean oil crush operation in Borg El Arab to meet the increasing demand in Egypt for soybean meal and vegetable oil. The company will also construct an additional 42,000MT of storage capacity within Cargill’s existing premises at the port of Dekheila in Alexandria. The expansion at the soybean crush plant will add a 3,000 metric tonne production line to Cargill’s existing facility. It will allow the company to leverage its existing crush capabilities to maximise economies of scale and efficiencies in its production process for both soybean meal and oil. 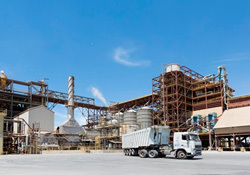 The extension of the facility at Dekheila, which discharges, stores and handles imported grains and oilseeds, will enable Cargill to optimize its supply chain, allowing for enhanced efficiency in the timely delivery of grains to its Egyptian customers and to its crush plant at Borg El Arab. Cargill is investing U.S. $100 million to double the capacity of its soybean oil crush operation in Borg El Arab to meet the increasing demand in Egypt for soybean meal and vegetable oil. Construction at the soybean crush facility is due to commence in November 2015 and the expanded facility is expected to be operational by mid-2017. Work to increase the storage capacity at the port of Dekheila will also commence in November 2015 and is expected to be completed by the end of 2016. The crush plant will be equipped with the latest technology, allowing the production of improved high protein meal, a fast growing product segment in the local market. As part of the investment Cargill will install equipment that will enable significant savings in power consumption for the new and existing plants. Cargill has been operating in the Egypt since 1994 serving the local agricultural sector through its grains and oilseeds business. It has been involved in soybean crush since 2004 through its majority share in the National Vegetable Oils Company (NVOC), producing crude soybean oil for the Egyptian market and supplying soybean meal to the poultry and aqua feed industry. Cargill also has a majority share in the National Stevedoring Company (NSC) in Dekheila port, which facilitates the discharge, storage and handling of imported grains into Egypt. As a 150 year old agricultural and food production company, soybean crushing is one of Cargill’s core capabilities around the world. The crush plant and storage facility are part of a network of over 1,000 state of the art facilities in 67 countries around the world. It will adhere to Cargill’s high standards of quality and environmental health and safety.